The bee is one of the oldest and perhaps the most important insect in the animal kingdom. Though small, it has shaped our world on a scale that most animals, bar humans, could never reach. Indeed, without the bee, our world would be much less colorful than it is; bees are the catalyst for the wonderful revolution in plant biodiversity that allowed for the creation of so many colorful flowers. Scientists believe that before the bee, plant life on earth consisted of large forests of conifer trees. Flowers simply did not have a strong enough medium through which they could widely pollinate before then. So, like Dorothy taking her first steps into Oz, the appearance of the bee transformed the planet Earth from a coniferous monotony to a Technicolor wonder. Though it’s clear that the bee has existed for a very long time, it is difficult to document their evolution in exact detail because most ancient bee samples come from the few of them unlucky enough to have been encased in amber for all eternity. What we know from these specimens is that the bee and the common wasp seem to share ancestry, as some of the oldest amber samples show a similar, but different insect with the characteristics of both bees and wasps. The oldest bee fossil, approximately 100 million years old. The oldest amber sample ever found dates back approximately 100 million years and was found in a Burmese mine (Goudarzi).This supports the idea that the bee’s ancestors are of asian descent, from where they migrated and eventually evolved into the many apis subspecies that live today. These different apis played a critical role in plant biodiversity. We know this because, even though fossil records are often sparse, we have an understanding of plant diversity throughout time. Logic says that bees, being a main pollinator, would appear alongside plant biodiversity because bees cross pollinate species of plants that would otherwise never mix. Several million years before the time that the above amber sample was formed, plants that relied on methods besides the wind to carry their pollen, like most flowers, experienced a tremendous increase in growth, thus placing the appearance of the bee around the Jurassic period and casting them as the world’s first modern artists, splashing color onto an otherwise green canvas (Goudarzi). Angiosperms are a very diverse variety of plant most commonly associated with flowering species, and are thus those that would be most affected by the appearance of a key pollinator such as the bee. Angiosperm radiation is a critical indicator of plant pollination levels. With the appearance of the bee’s ancestors, this key statistic increases. Note that the largest increases begin around the Jurassic and extend into the future. Diptera is the order that contains the common housefly, Hymenoptera is the order of insects that includes bees. The insect we call the honey bee, however, lived later, in tropical Africa, and spread to Europe, where it adapted to live in temperate environments (Amdam, Norberg, et. al). In terms of European-American history, this is where our contact with the bee begins. Bee Behavior: Bee Together, Bee Bold. For the worker bee, everything comes down to what is best for the hive and its queen. The hive is everything. It’s a nursery, a shelter, and when need be, a fortress. The needs of one are given up for the needs of the many; sick bees will leave the hive to die so that they don’t infect the others. Drones who do not work, and are therefore a burden on hive resources, are killed (Preston). Bees are prone to swarming, another manifestation of the collective mentality that defines a hive. Bees are small, and in a world where everything can be a predator, there is only one way to survive. Move as one; it’s the safest way to attack when you find yourself outweighed. Hornets, a large but common predator to the honey bee, often invade hives; they kill the workers and plunder the hive for larvae and honey. Some hives have developed a response to this threat, swarming the unsuspecting insect and attaching themselves to its body. Then, the colony heats up their bodies to a collective 47 degrees Celsius by vibrating the muscles in their wings, essentially baking their predator-turned-prey alive (Waugh). It is this kind of unity and coordination that makes hive defense possible for such a small creature. At the center of bee society is the queen. Larger than the workers, who are exclusively male, the Queen’s only job is to lay eggs. But for the hive, this job is important enough to warrant her total protection. The queen rarely leaves the hive, and all of the workers tend to her every need. It is interesting to note that the Queen can control the gender of the eggs she lays, thus allowing her to populate the hive with the workers and future queens it needs. The Queen bee. Note the larger thorax. Bees possess one of the most advanced social systems in the animal kingdom. Decisions in the hive are made through a democratic process, right down to location. In 1949, Martin Lindauer, a young graduate student, noticed a swarm of bees wiggling on a bush–almost like they were dancing. Thinking that they were foraging for food, he examined them but found none of the typical markings of such a process. Fascinated, Lindauer examined many instances of such behavior and discovered that each bee was, in fact, indicating a specific location with the movement of its thorax, almost like a vote. Ultimately, Lindauer surmised that the bees were not foraging for food. Rather, they were selecting the site for their new hive and voting with those movements. To test his theory, Lindauer followed bees he observed in this behavior and discovered that at or near the site of their final dance, a new hive would soon be built (Seeley 16). When we talk about evolution, we talk about how creatures adapt to their environment. In the way that humans adapted a singular intelligence to conquer their environment, it can be said that the honey bee’s adaptation to the world around it is their collective intelligence. It is easy to see a low intellect in such a small creature, but size does not do the bee justice–indeed, it exhibits a more effective democracy than some countries and knows how to organize itself so well that any militia would be jealous. Although undoubtedly useful to nature, it is difficult to label the bee as a domesticate in the same vein as the dog or the horse because, as Charles Darwin himself noted in his 1868 publication aptly entitled “The Variation of Animals and Plants under Domestication”, it’s hard to domesticate something without having total control over the population. Bees, being both airborne and very small, can’t be contained in the same way that sheep or cattle can. Even so called “domesticated” bees can still breed with their wild counterparts, thus diluting efforts to preserve any one trait and keeping human changes to the species at a minimum. Also, the so-called uses for the domesticated bee are simply things that the bee will do on its own in the wild, if left alone. Things like pollination, making honey, and even stinging are not examples of bee behavior adapted for human purposes in the same vein as labor animals like oxen or cattle. Ultimately, this means that the talk of bees as a domesticate refers to little more than controlling where they live. With this in mind, the bee has been kept by humans for approximately 7000 years (Harpur, et. al). In that time, we’ve developed different uses for the bee. Initially, we would have sought out beekeeping as an easy means to get honey. Over time, as science’s role in our lives grew, we came to see them as useful stewards of nature, propagating the cycle of plant reproduction via pollination. Today, bees support everything from the American agriculture industry to new pharmaceutical ventures in the form of a cutting edge medical treatment known as apitherapy, named after the bee’s apis latin root. Honey, still in the hive. Before people began to understand the more scientific applications of the bee, its honey was a subject of much apotheosis in the ancient world. It’s easy to see why—visually, honey looks like liquid gold, a strong symbol of power, wealth, and longevity. The medical applications of honey as an antiseptic were also well understood. Perhaps most of all, honey would have had a singular existence in the ancient world not just as one of the only available sugars, but also one of the only available sugars that stored well for long periods of time. Thus, the need to keep bees near humans was clear and over time the insect worked its way into our cultures and our myths. Perhaps no culture is as indicative of this relationship between man and bee as the ancient Greek’s. The Greeks spoke of nectar and ambrosia, the food of the Gods; both substances were equated with the immortal and the divine; the nymph Thetis anointed Achilles in ambrosia so as to make him immortal. The famous German scholar Wilhelm Heinrich Roscher posited that the two divine foods were also likely derived from honey. The myths suggest that the consumption of either is enough to deify a mere mortal. The Gods ate nothing but nectar and ambrosia; it was even said in the Iliad that those who drank ambrosia no longer pumped human blood through their veins, but the blood of Gods—the golden, honey-like ichor. In this sense, honey transcends the insects that created it and it becomes clear that it is not like other foods. It is special and so are the people that eat it. To understand how significant this is, one need only look at Christianity and the sacredness of the blood of Christ. The idea of ambrosia as a sacred liquid that changes the people who consume it is very similar to the Sacrament of the Eucharist in which Christians consume wine as the blood of their savior. The difference is that this divine liquid comes not from the heavens, but from the common honeybee. That the production for such a wonderful thing would be delegated to one of nature’s lowliest creatures says worlds about how important honey was to the Greeks. They knew very well where honey came from, but placed it on such a high pedestal that it naturally entered into myth and religion alongside stories of magic labyrinths and flying horses. Though initially bees were sought after and kept for honey, once people began to understand their role in pollination the agriculture industry adopted beekeeping as a common practice. During the last century and into the present, Hives had a crucial role in American agriculture by pollinating the plants that eventually bear the fruits and vegetables we consume on a daily basis. It is typical to find many man-maintained bee colonies on a modern farm. However, in the last several years a phenomenon has arisen that threatens the cornerstone of our produce industry; the bees are dying, as much as 50% of farm bees in the last year. If the bees die, our agriculture industry would run to a grinding halt. The rapid decline in bee population has already increased replacement costs for farmers, costs which will undoubtedly carry on to the consumer. Colony Collapse Disorder (CCD) is not a new problem, history notes several instances when mass die offs were prevalent. Though explanations range from viruses to cell phone radiation, there is a much more likely explanation for the death of commercial bees. Namely, the use of pesticides that could poison them when they land to pollinate. Because bees are so social and live in such close quarters, the toxins could spread rapidly through the hive. This recent wave of Colony Collapse Disorder coincides with the use of a new pesticide called neonicotinoids. It’s been shown that exposure to the new pesticide causes negative health effects in bee brain function, even hampering its ability to return to the hive (New York Times, Editorial). In April 2013, despite a lack of consensus among member states, the European Commission temporarily banned the use of neonicotinoids on most crops, citing concerns over declining bee population, however if the bee populations experience a strengthening as a result of the ban it is likely that the ban could continue (BBC). In the 7000 years since people began to keep them, we have even found a use for the bee’s venom; something that logic dictates we ought to avoid. Although allowing a bee to sting you seems dubious, studies have shown otherwise. In 2003, a study was conducted in China regarding the effectiveness of apitherapy in treating viral diarrhea in young pigs. One population of pigs was treated with modern medicine, the other with bee venom. How did you think they were going to do it? The results were surprising; bee venom proved to be just as effective in treating the condition. It appears that bee venom, or rather the toxin melittin found inside it, has the ability to destroy the protective envelope that surrounds viruses and kill them. The implications of apitherapy are tremendous; in the first months of 2013, it was discovered that, when combined with a nanoparticle solution so as to not harm healthy cells as well, melittin kills the HIV virus and circulates through the body without causing any harm. Because the HIV virus is smaller than normal human cells, the particle solution lets venom pass over healthy cells and only target viruses. Apitherapy is a growing field and, as scientists learn more about it, could be expanded to treat other illnesses such as Hepatitis (Nordqvist). By now it should be clear that the term “Busy Bee” is not a coincidence. From the inside of its hive, the bee has assisted with everything from flowering plants to curing HIV. No other creature, bar humans, has contributed as much to the changing narrative of our world as the bee. The bee appears, and in a few million years the Earth explodes in vivid color, and it started with one bee and one plant. Small creatures affect small changes with enormous impact. In that sense, the bee presents an interesting parallel to our own story, in which our towering cities and the kaleidoscope, honeycomb walls of the beehive abstract, lose their differences, and become two like bodies whose only difference is scale. “Apitherapy: Usage and Experience in German Beekeepers.” Apitherapy: Usage and Experience in German Beekeepers. N.p., n.d. Web. 07 Apr. 2013. Board, The Editorial. “EDITORIAL; Calamity for Our Most Beneficent Insect.” The New York Times. The New York Times, 07 Apr. 2013. Web. 07 Apr. 2013. “Bee Deaths: EU to Ban Neonicotinoid Pesticides.” BBC News. BBC, 29 Apr. 2013. Web. 05 May 2013. Homer, Robert Fagles, and Bernard Knox. The Iliad. New York, N.Y., U.S.A.: Viking, 1990. Print. “Higher Vitellogenin Concentrations in Honey Bee Workers May Be an Adaptation to Life in Temperate Climates – Springer.” Higher Vitellogenin Concentrations in Honey Bee Workers May Be an Adaptation to Life in Temperate Climates – Springer. N.p., 01 Nov. 2005. Web. 05 May 2013. Nordqvist, Christian. “Bee Venom Destroys HIV And Spares Surrounding Cells.” Medical News Today. MediLexicon International, 03 Nov. 2013. Web. 07 Apr. 2013. “Oldest Bee Fossil Creates New Buzz.” Msnbc.com. N.p., n.d. Web. 07 Apr. 2013. Preston, Claire. Bee. London: Reaktion, 2006. Print. Seeley, Thomas D. Honeybee Democracy. Princeton, NJ: Princeton UP, 2010. Print. Waugh, Rob. 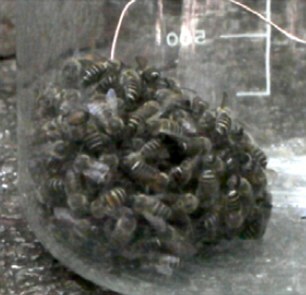 “Beware the Hot Defensive Bee Ball: Video Reveals How Bees Can Overwhelm Inch-long Hornets by COOKING Them inside Huge Ball of Bodies.” Mail Online. N.p., n.d. Web. 05 May 2013. Wines, Michael. “Mystery Malady Kills More Bees, Heightening Worry on Farms.” The New York Times. The New York Times, 29 Mar. 2013. Web. 07 Apr. 2013. This entry was posted in Uncategorized and tagged Ambrosia, Apis Mellifera, Apitherapy, Bee, CCD, Colony Collapse Disorder, Nectar, Overview on May 5, 2013 by Bill Libby.